NEW! 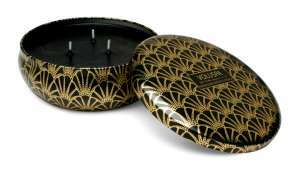 Voluspa Seasons Three-wick Tin in Makassar Ebony Peach. This fragrance is also available in the Vermeil collection. I received this as a gift. Then I bought myself another one and three for friends. It's my favorite scent. An amazing candle. I've always loved candles so when I first got a whiff of this scent at a friend's house, I knew I had to get it. Everyone at the gathering was mesmerized by this scent! I can't wait to start burning the ones I just ordered. 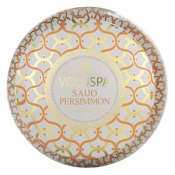 Makassar Ebony Peach is hands-down my favourite Voluspa scent. This isn't a sweet, fruity peach scent. It definitely smells like peaches, but it has a dark, heavy, almost smoky quality. It has lots of ebony and mahogany wood notes... it could even be a unisex scent. The three wick candles are definitely the best deal - they last forever, are only $18 and the beautiful tins are reusable! This candle has the loveliest scent. It is spicy and sweet all at the same time, but not overwhelming in any way. I leave it burning during the day when I am home and its soft and comfortable. 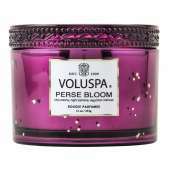 I am a huge fan of the voluspa 3-wick candles; they smell fabulous and last fairly long; great value for the money. Makassar is my favorite scent these days. A staple in my home! Burns for hours, smells wonderful & makes everyone ask what is that smell! Unique scent, high end candle. Perfect to use yourself or gift to loved ones. I absolutely LOVE this fragrance and LOVE this candle. It is a great value. The wonderful fragrance fills the house. 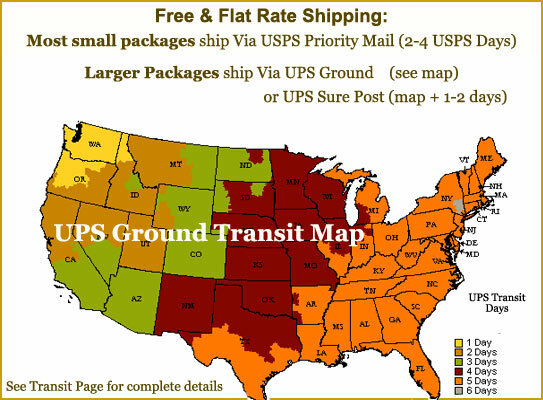 Also, Zanadia.com has the best customer service that I know of. I Would recommend this fragrance and Zanadia.com.